The modern “Erlebnistherme Zillertal” in Fügen provides water fun as well as a relaxing feeling. 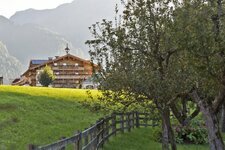 The thermal bath is located in Fügen in the beautiful Zillertal valley. The outdoor swimming pool - a paradise for kids. The water slides are always popular. … and not only with the little guests. The outdoor pool of the thermal bath. Fun and action are waiting for you. The “Erlebnistherme Zillertal” is open all-the-year. The restaurant is accessible from the thermal bath as well as from the sauna world. Children have fun in the adventure pool. Pure relaxation - the wellness area. Indulge into the sauna world. The Black and White Sauna: pleasant light effects provide a cosy atmosphere. The “Erlebnistherme Zillertal” by night. A state-of-the-art thermal bath expects you in the Zillertal valley. A wave basin, a 133 m long “Black hole” water slide as well as an adventure pool create a new dimension of leisure activities. There are many attractions: children can enjoy romping on a climbing net above the water surface. However, if you rather would like to relax, indulge into the sauna world of the adventure thermal bath Zillertal, where pleasant light effects, stimulating aromas and calming sounds provide a cosy atmosphere. New are the natural brine pool and the Swiss-Pine-Bio-Sauna. Fun and action for adults and children are offered in the outdoor pool, where a water jet, dousing shower, starfish, air bubbles, trampolines and many more attractions await you. After exhausting water experiences you can sit back and relax on the lawn, including an area of 5,000 sqm. There is even an area for babies, where they can splash to the top of their bent. Moreover there is a games area and the little ones are really enthusiastic about playing there with friends! By the way: for all those who do not want to spend a whole day in the thermal bath, there is also a two-hours ticket available.